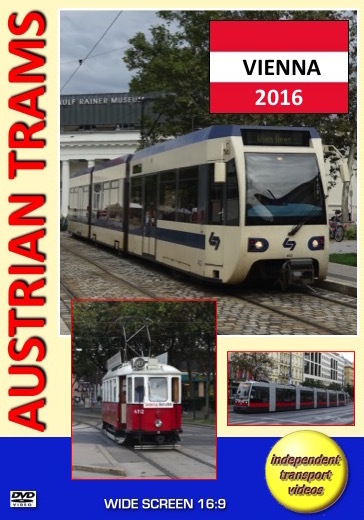 In September 2016 the independent transport videos cameras returned to the beautiful city of Vienna to update the tram scene, visit the superb tram museum and take a look and ride on the Wiener Lokalbahnen light rail in more detail. The present tram system is run by the city owned Wiener Linien and is the largest European tramway system outside the former Soviet Union. Vienna has a mixture of old and new suburbs most of which are served by the tramway. The system is mostly street running although there are a number of sections that run underground and connect with the U-Bahn. There is also the specially branded Ring Tram that starts from Schwedenplatz. The current fleet is made up of ‘E2’ class articulated cars – mostly with a trailer car, along with just a handful of ‘E1’ cars still in service at the time of our visit. These cars are of the German Düwag design made in Austria under licence by Lohner, Rotax and SGP. The latest low-floor cars are the ULF (Ultra Low Floor) that have been developed for the Vienna network by Siemens. The first examples have been in service since 1995 and there were over 330 in service at the time of our visit. Filming in the first part of our visit to Vienna takes place around the ‘Vienna Ring’, with Schubering and Schwarzenbergplatz being the first locations. We then move along to Karlsplatz, Wiedner Hauptstraße, Kärntner Ring and Operning where we also see the cream and blue trams of Wiener Lokalbahnen at their Vienna terminus. These high-floor trams are of SGP manufacture and the low-floor trams are Bombardier manufacture to the Flexity Classic design. Our cameras continue around the ‘ring’ filming at Ringstraße and at the busy ‘double-deck’ interchange at Schottentor. Our ‘ring’ filming concludes at Schottenring and Schwedenplatz. We then join tram 777, a Siemens ULF B1 tram on line D to Schwarzenbergplatz and see ‘heritage’ tram 4149 on a private hire duty. We then join ULF tram 741 on Line 18 to Schlachthausgasse, which is the location of the Vienna Tramway Museum. After our visit we ride on tram 4079+1470, an SPG ‘E2’ tram on Line 18 to St. Marx and then continue on ULF 643 on Line 71 to Operning. Another ride on ‘E2’ class 4091+1517 is on Line D to Nußdorf terminus. We complete our Vienna filming at the two main railway stations of Hauptbahnhof and Westbahnhof. The second part of our programme is on the Wiener Lokalbahnen light rail system. We begin in Vienna at the start of the line at Wien Oper when we join tram 410, a Bombardier Flexity Classic and travel the entire length of the route to Josefsplatz in the pretty town of Baden some 28km from Vienna. On arrival at Baden we explore the picturesque town centre and film both the trams and the Wiener Lokalbahnen buses that operate a number of feeder services from the surrounding villages and small towns. Some new Mercedes Benz Citaro single-deckers are featured in their smart cream and blue livery. Locations include Kaiser Franz Joseph-Ring and Conrad von Hötzendorf-Platz. Our filming concludes at the Wien Wolfganggasse depot of Wiener Lokalbahnen. We hope you enjoy your visit with us.